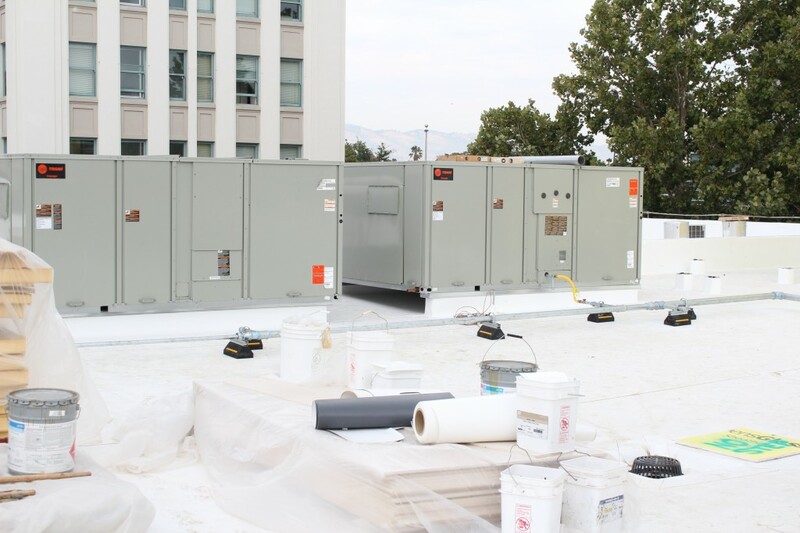 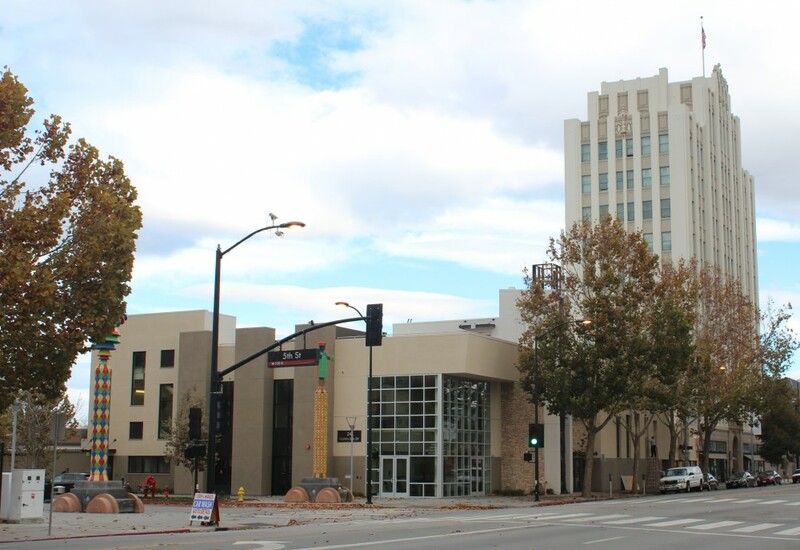 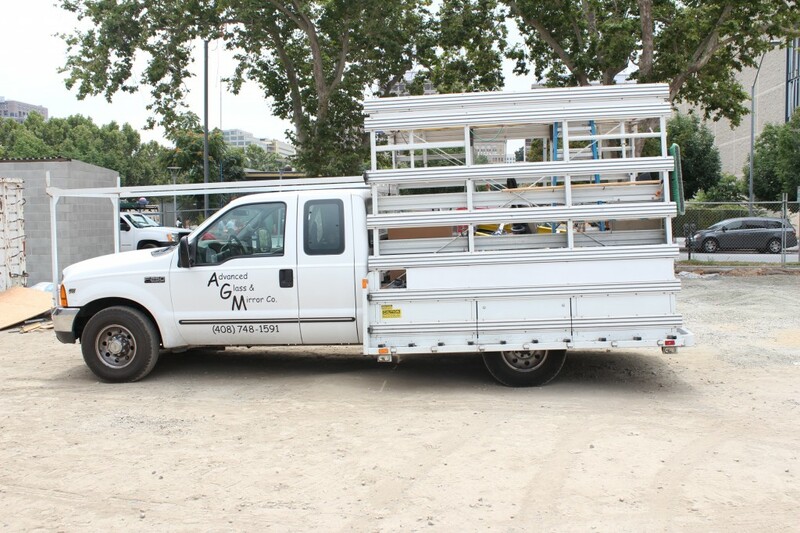 Last week the equipment that will drive airhandling for the building was installed on the roof. 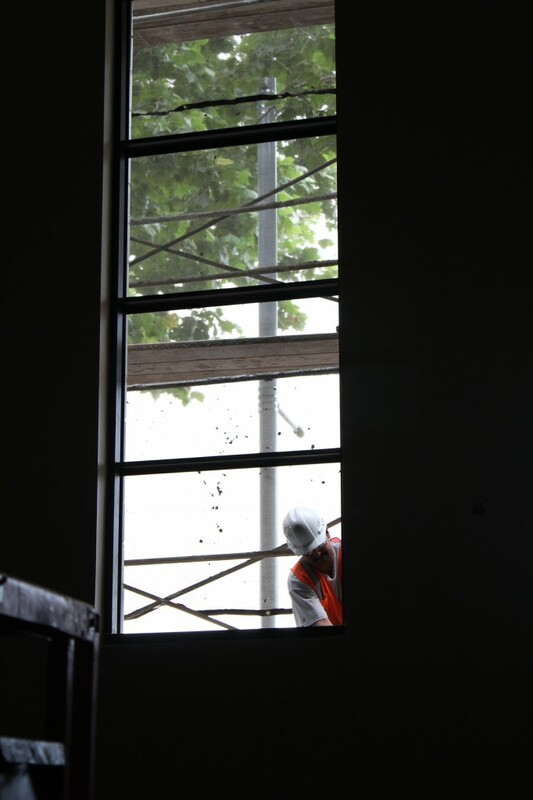 Preparations have begun for the exterior window glazing for the new building. First steps are to prepare the window frames for the glass. 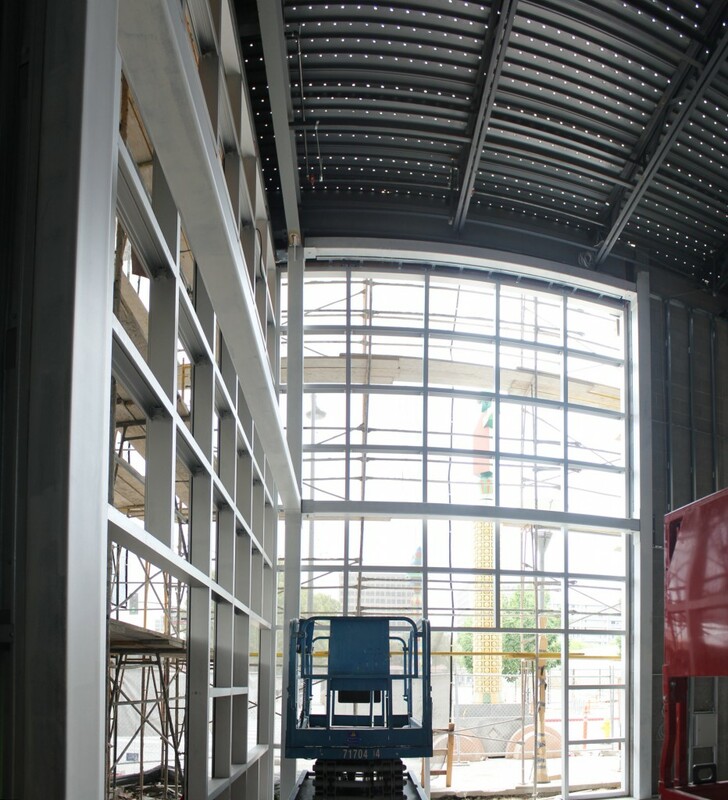 Framing for the glass doors and windows in the atrium is complete. 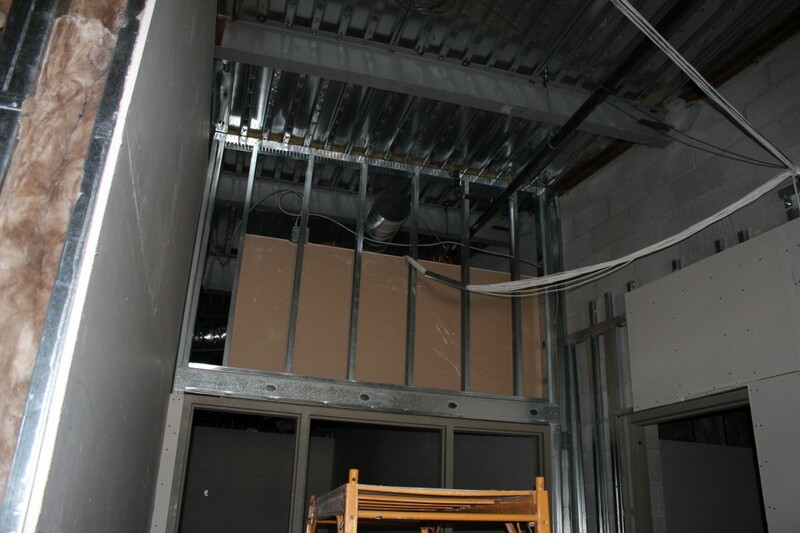 Significant projects were completed in the Sanctuary over the last week. 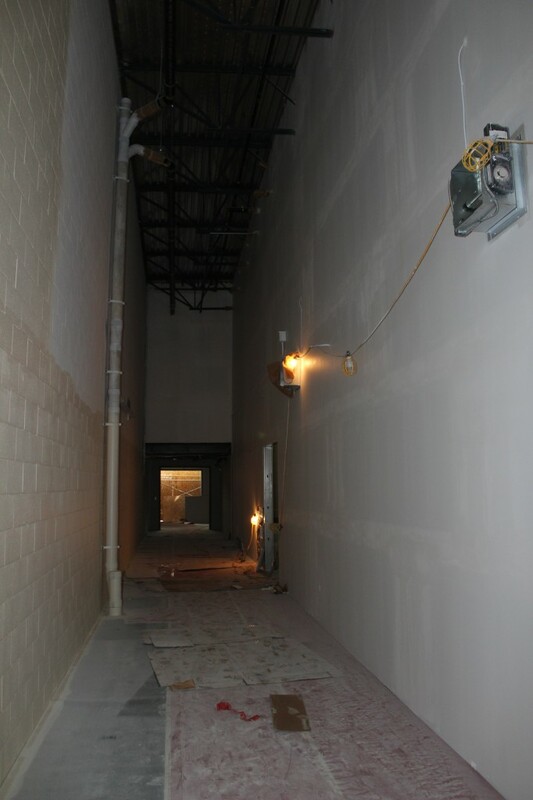 Painting of the east wall was completed. 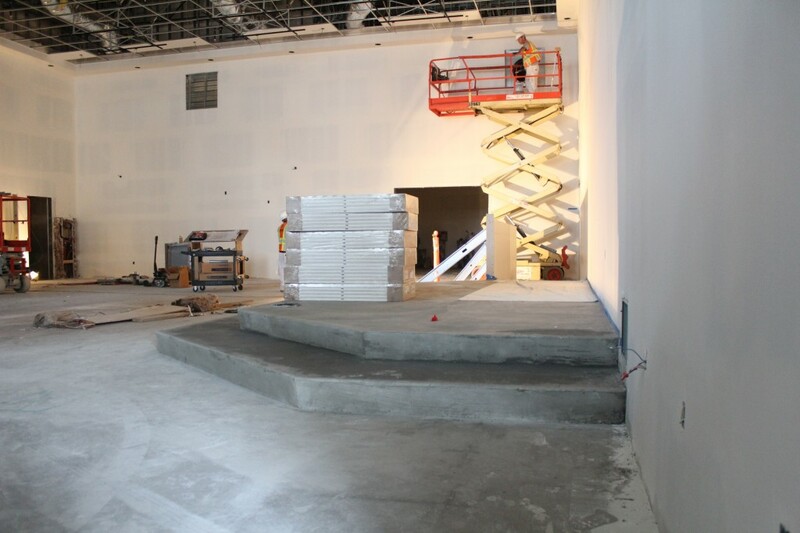 The concrete for the platform was poured. 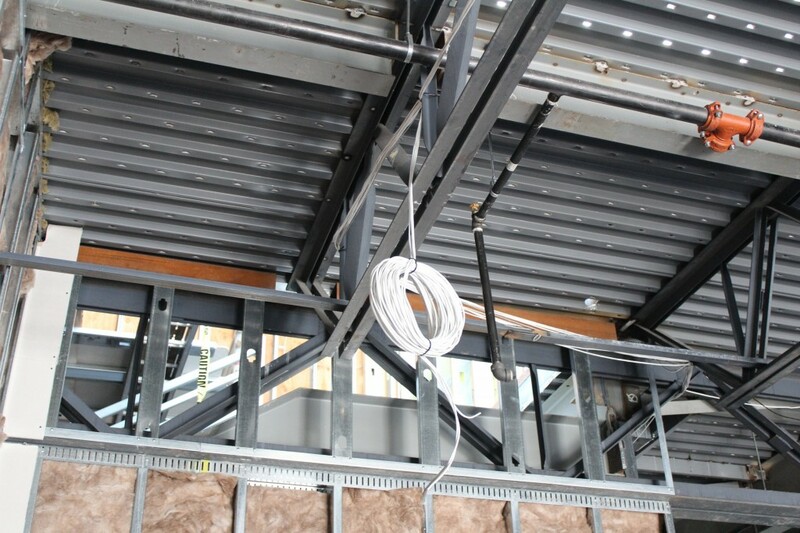 Wiring in the techbooth for AVL equipment is proceeding and switches for the control of seven rows of lights in the sanctuary was installed. 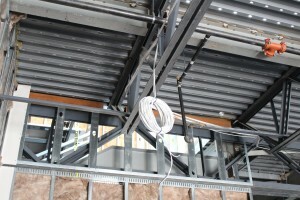 These lights can be controlled from inside the tech booth or in the sanctuary. 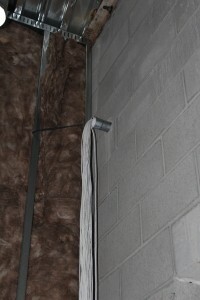 Painting conintues is many areas of the Church. 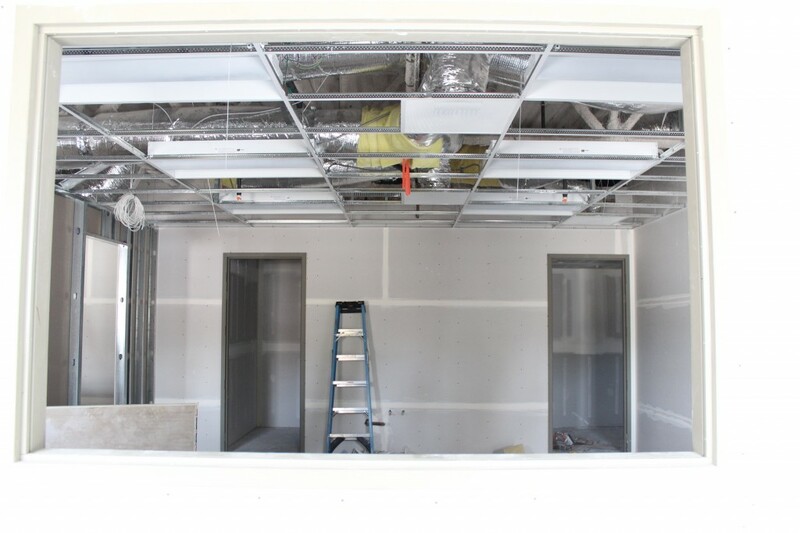 Each day additional rooms are painted. 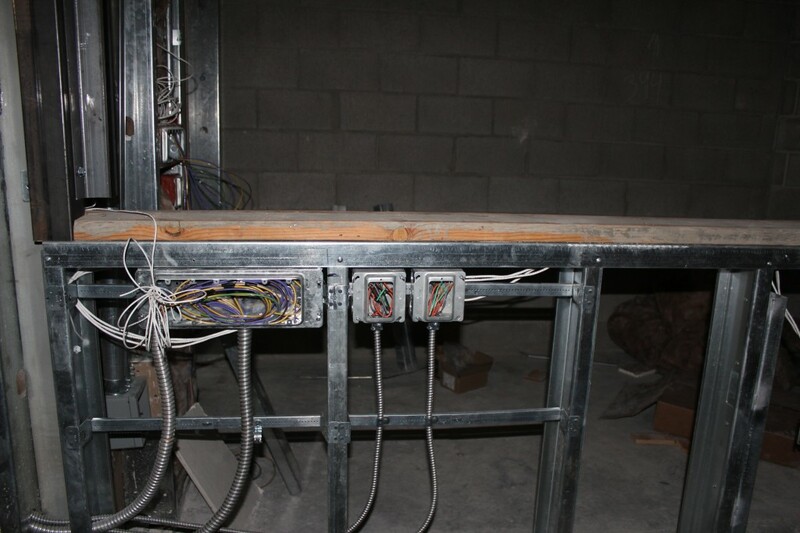 In some cases this is the preparation/primer for the final finish. 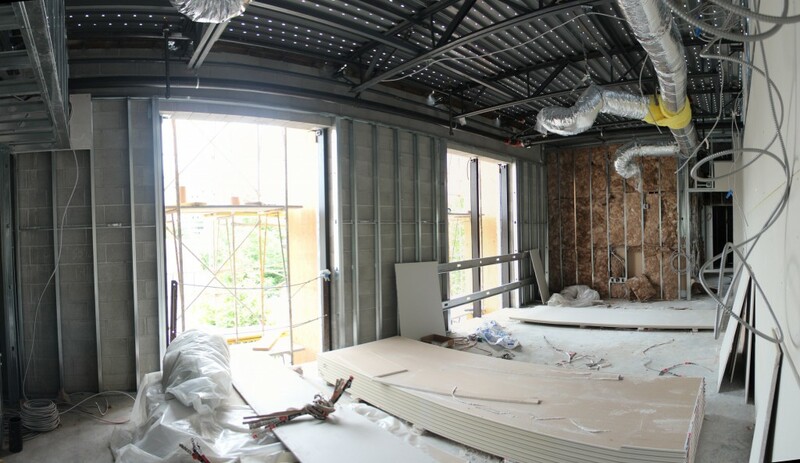 In other cases the painting being completed is the final finish, for example in the youth room and back-of-house. 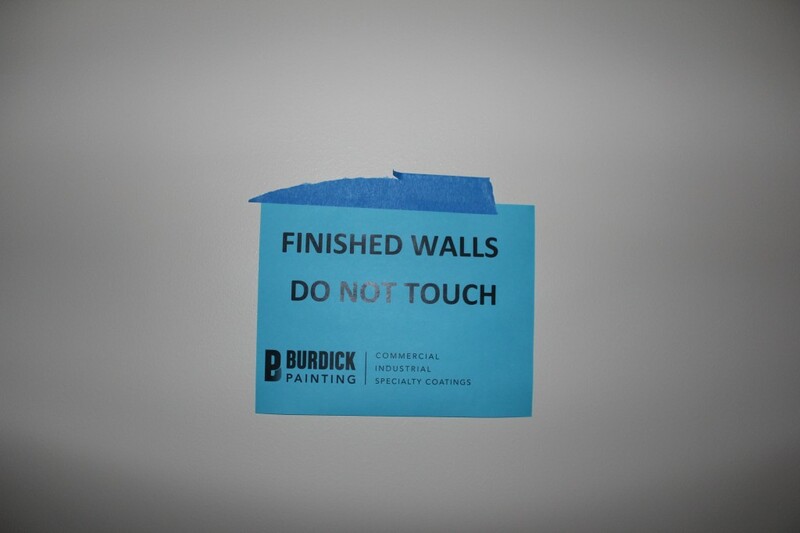 Back of the house painted. 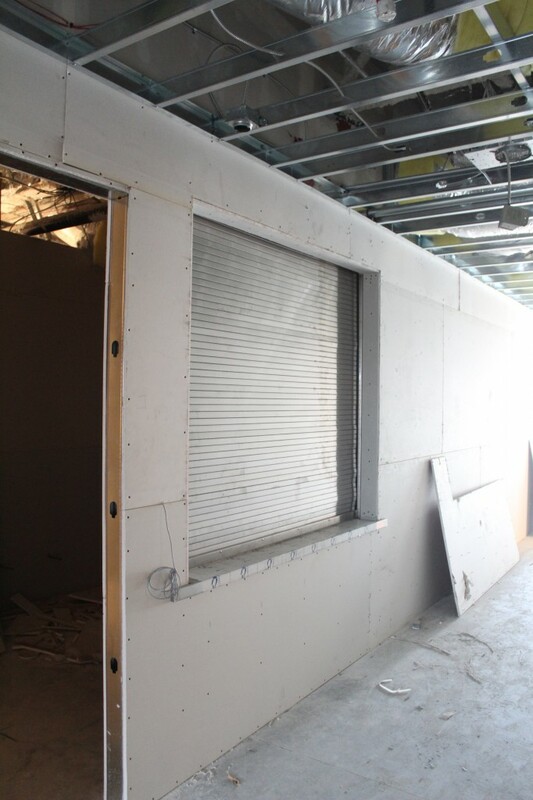 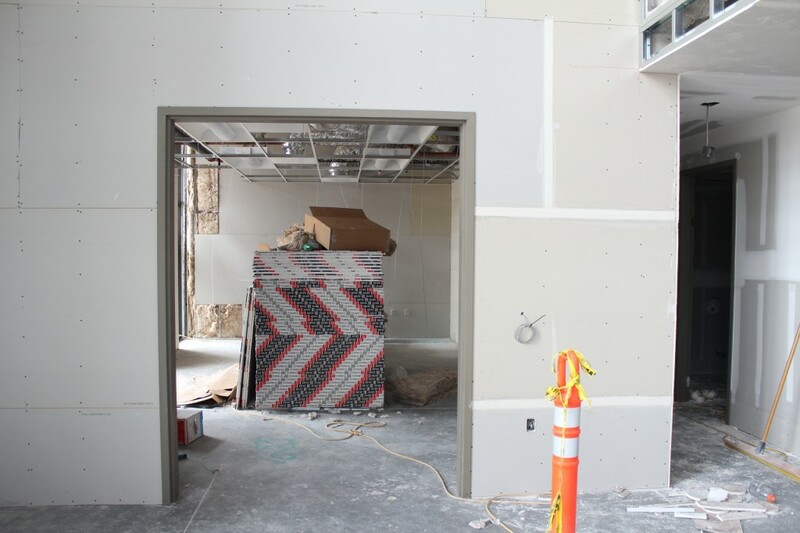 Sheetrock has been installed in a majority of the building now. 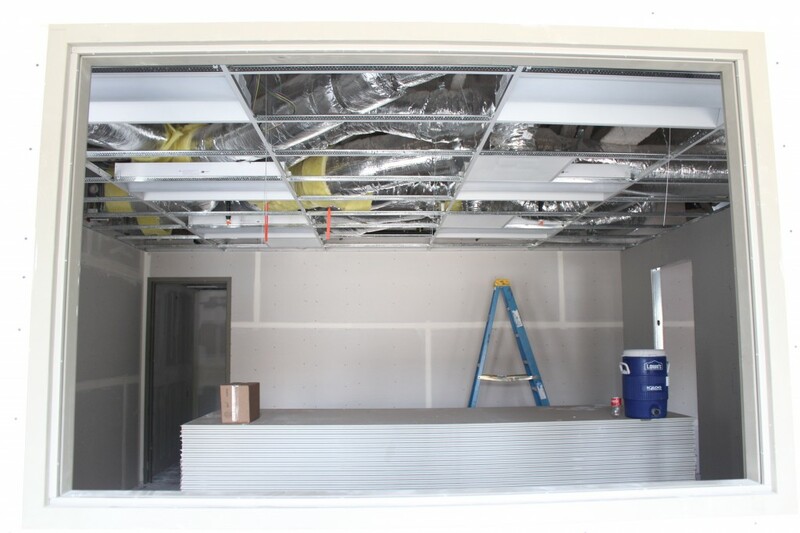 There is some touch up and a few areas are yet to be completed. 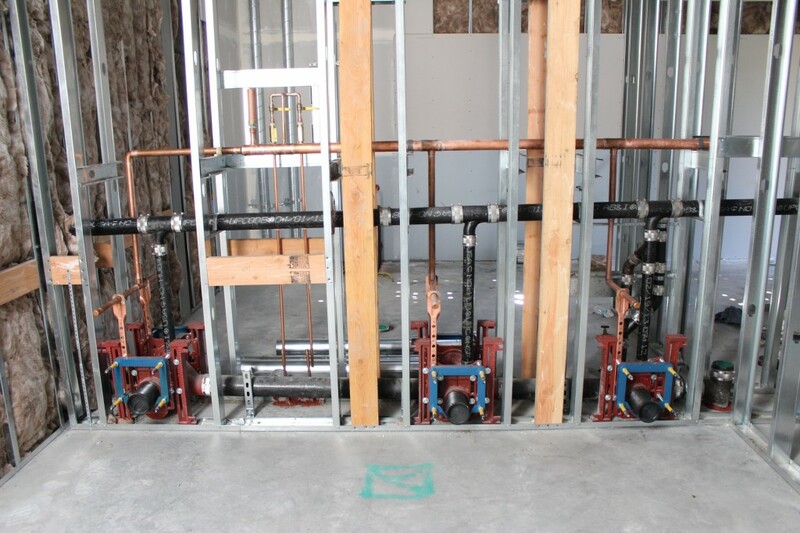 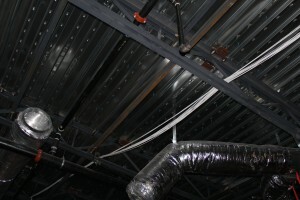 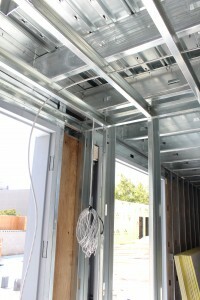 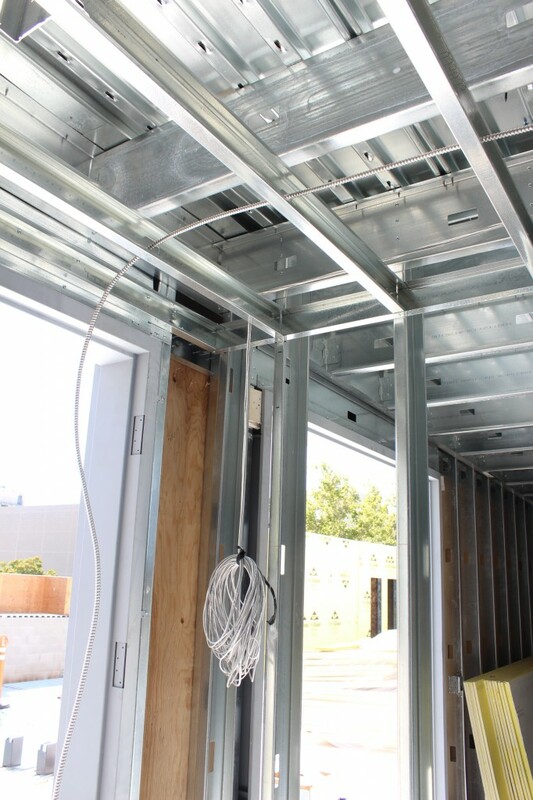 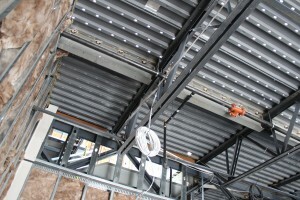 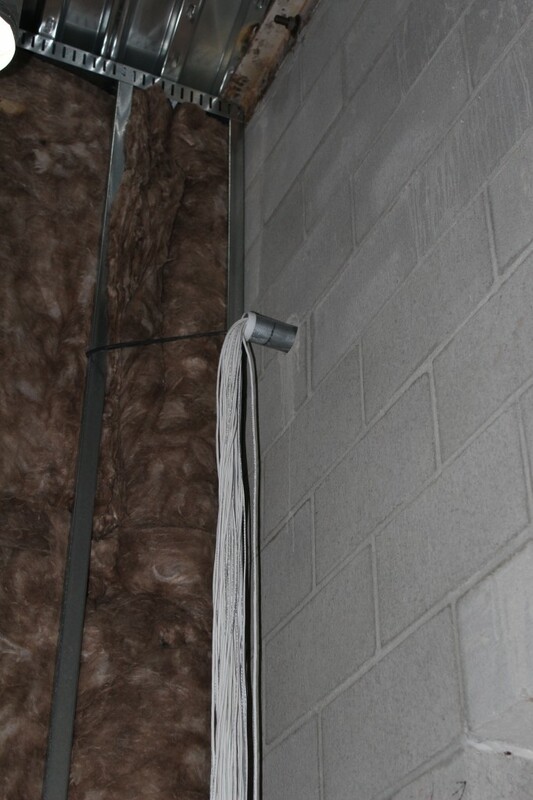 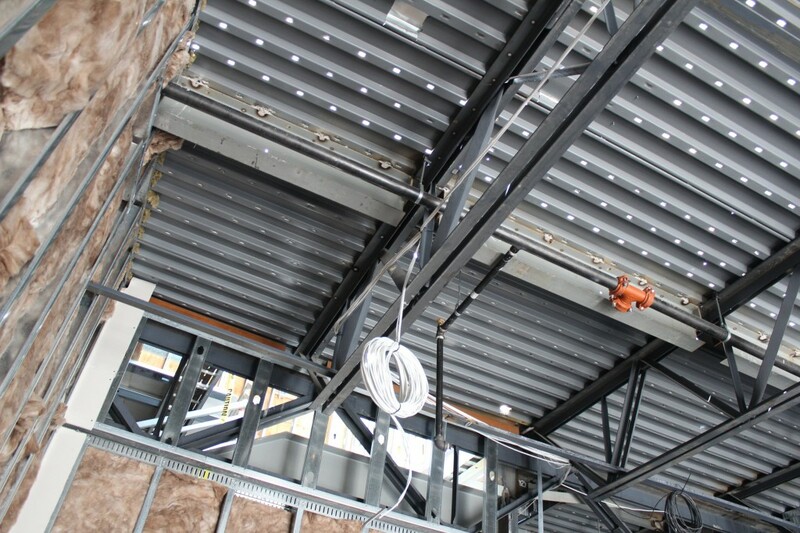 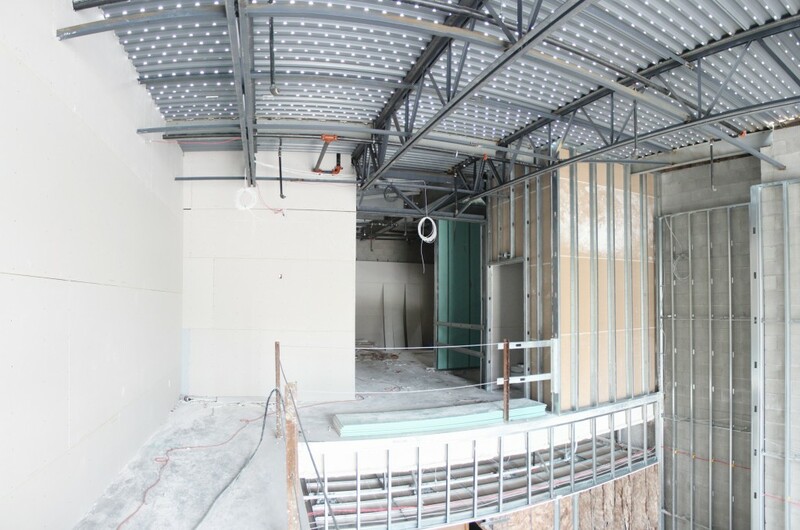 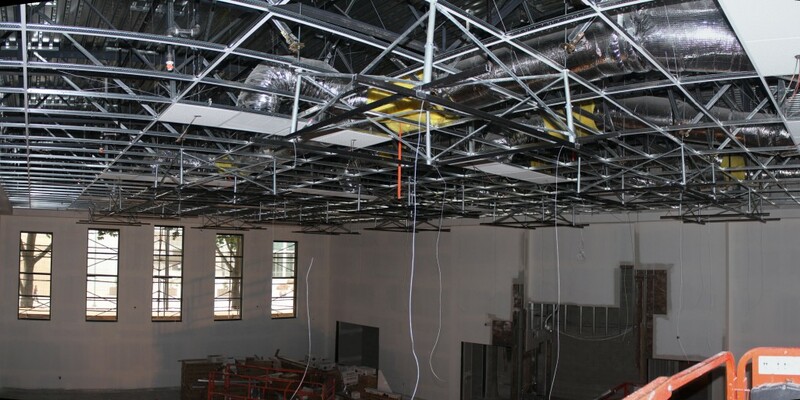 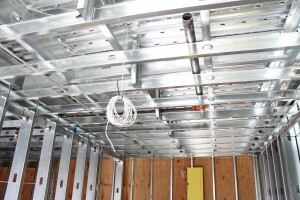 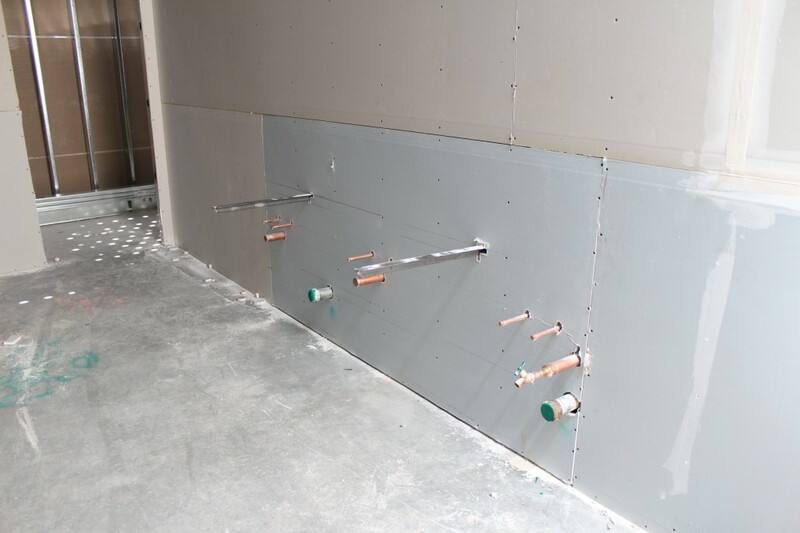 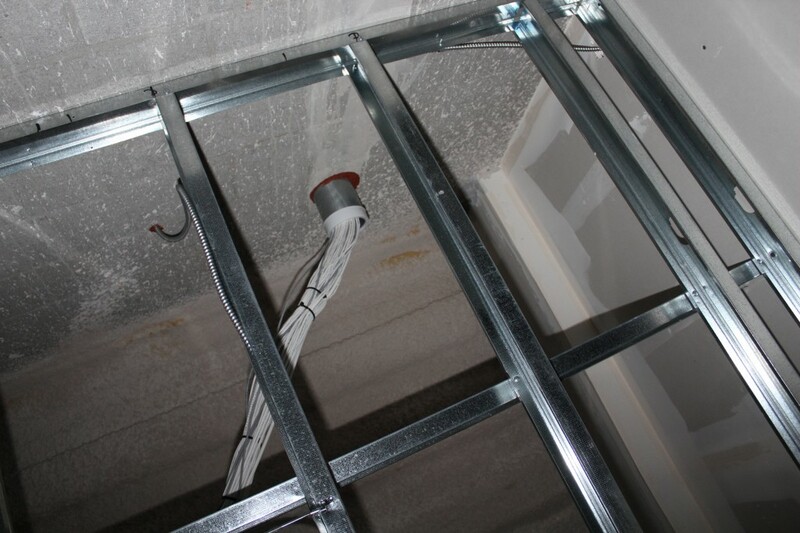 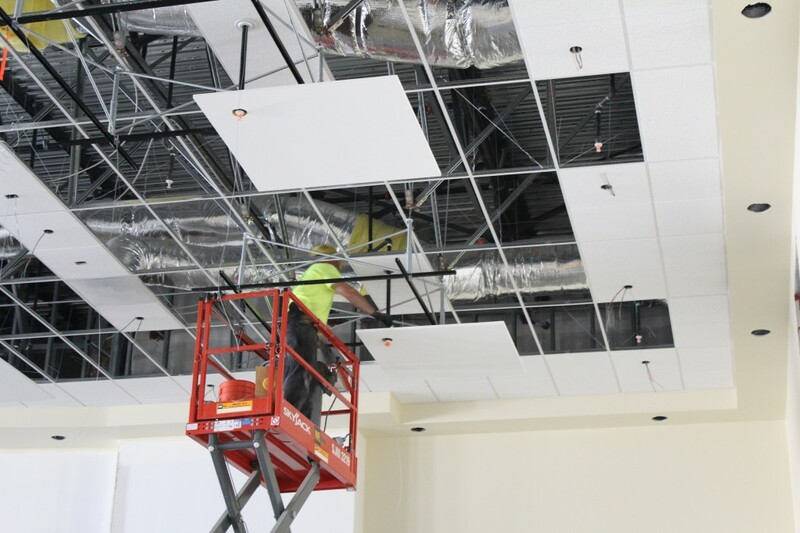 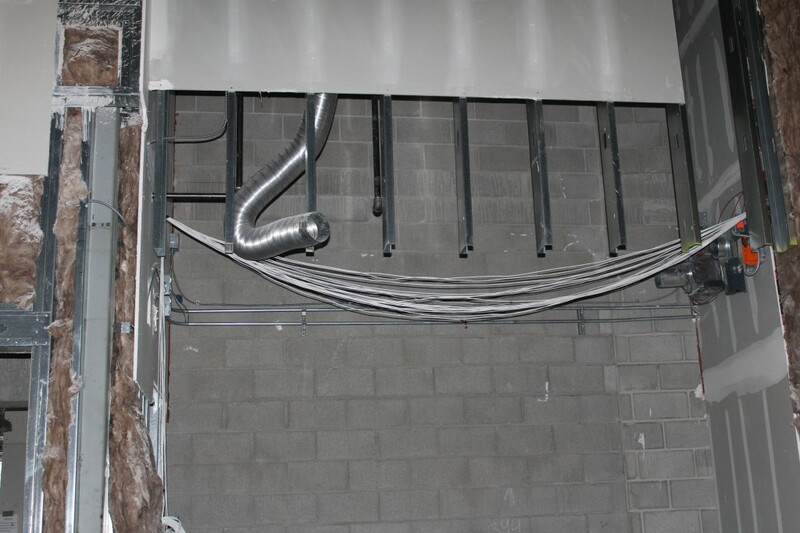 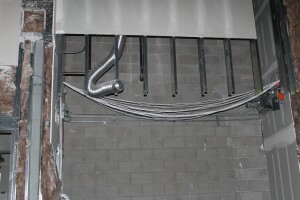 As sheetrocking is completed ceiling frames are installed so electrical and HVAC systems can be finished. These pictures are of pre-school rooms. 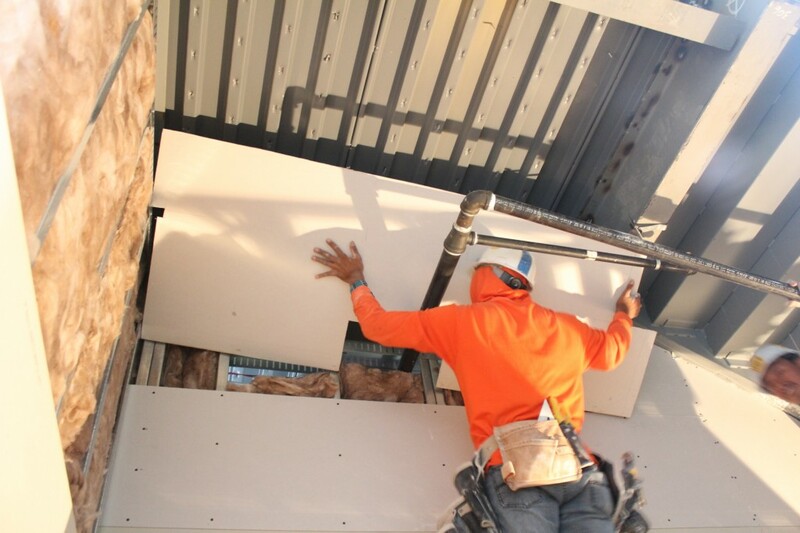 Sheetrocking complex areas such as the entry way to the roof deck can be tricky. 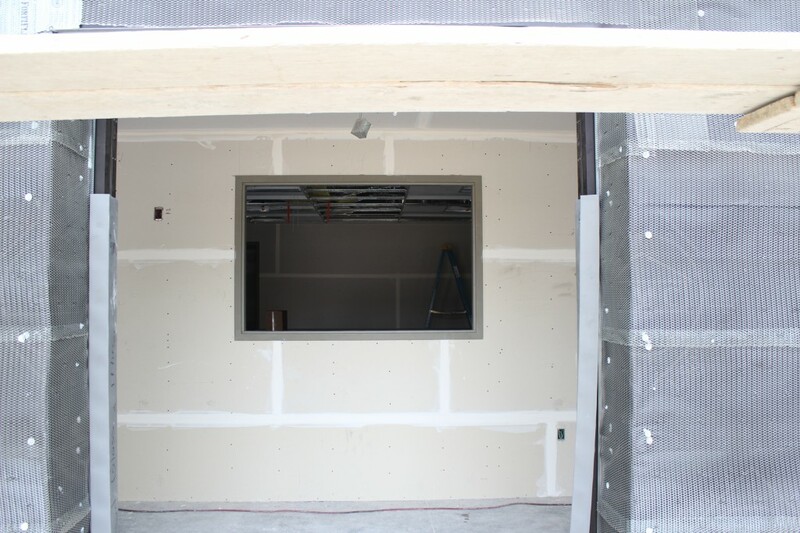 The kitchen serving door is now installed. 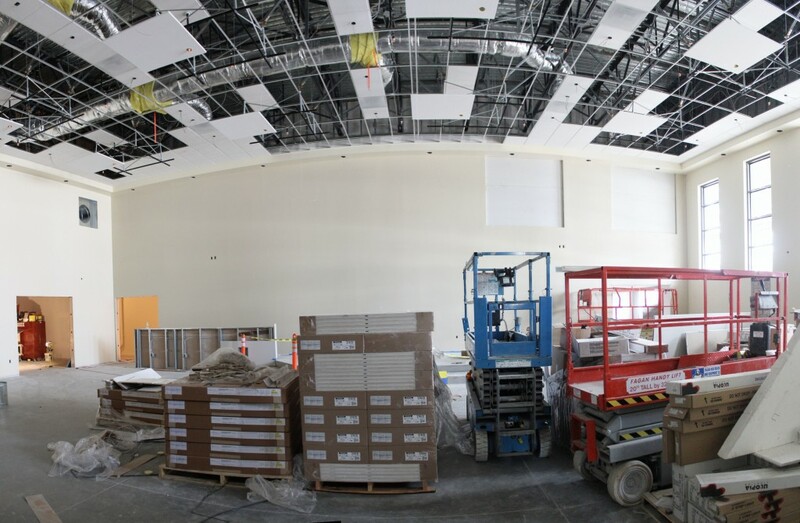 HVAC work continues in the Western conference room. 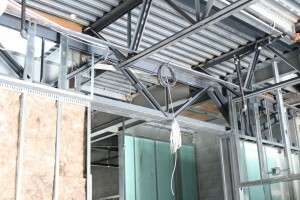 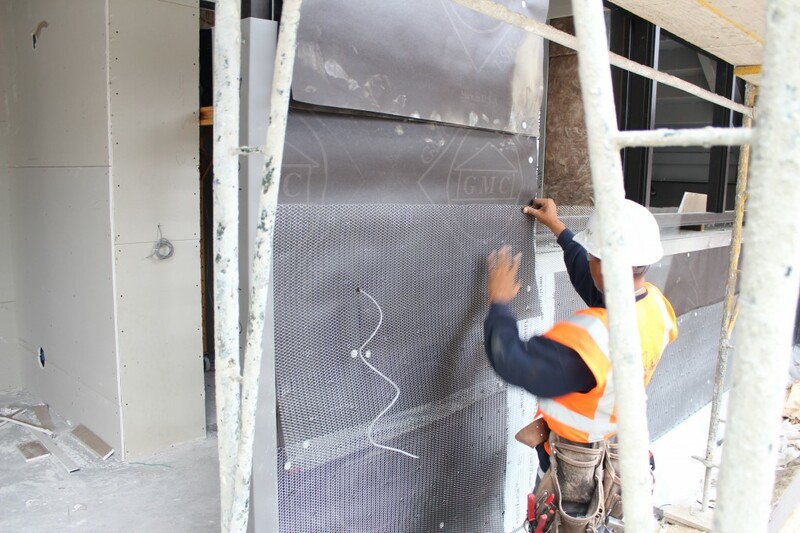 The outside of the church will have a number of finishes. 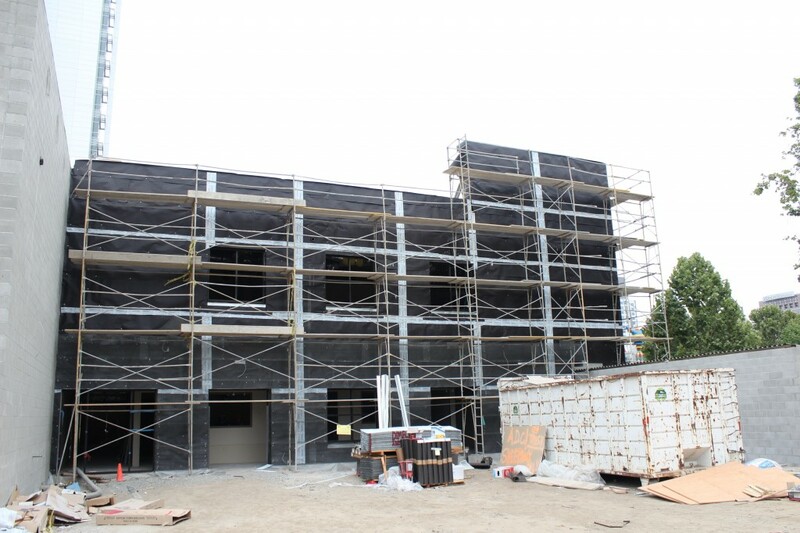 Preparation has started for applying the stucco on the north and east sides. 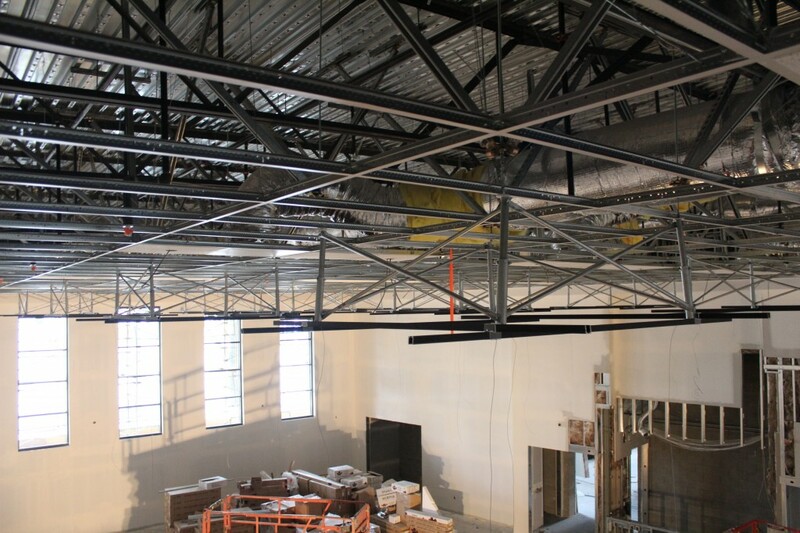 As you may have noticed in previous drawings, there will be “clouds” hanging just below the Sanctuary ceilings. 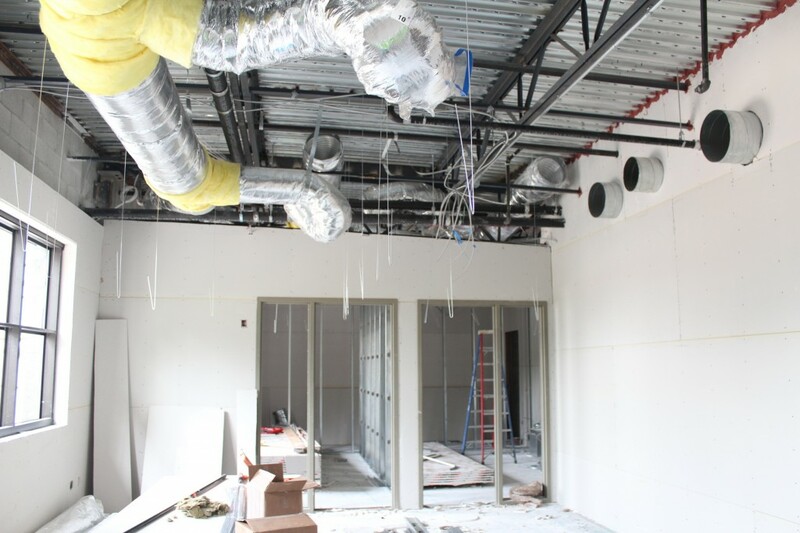 These will be both cosmetic as well as functional. 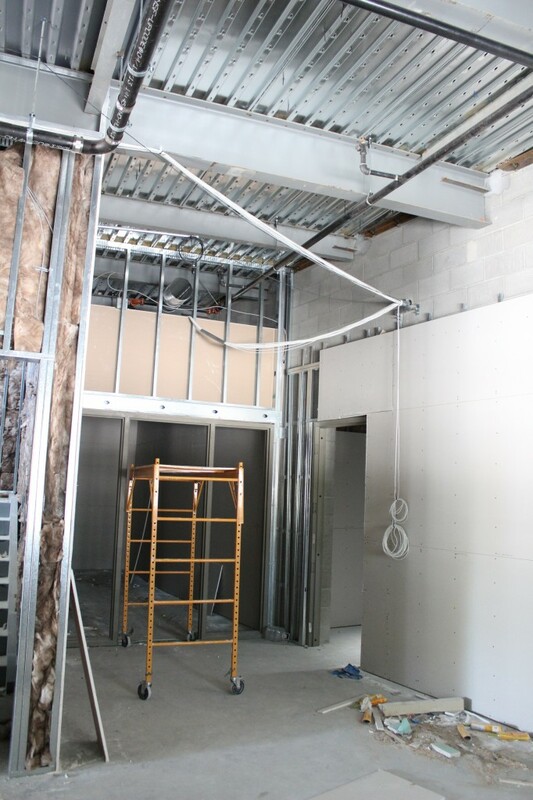 Construction of these rectangular shapes has started. 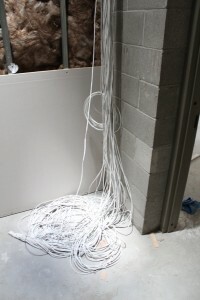 Even though a majority of the connectivity we utilize in our daily live today is via wireless technology, there are many wires in the walls, ceilings and passageways that enable this technology. 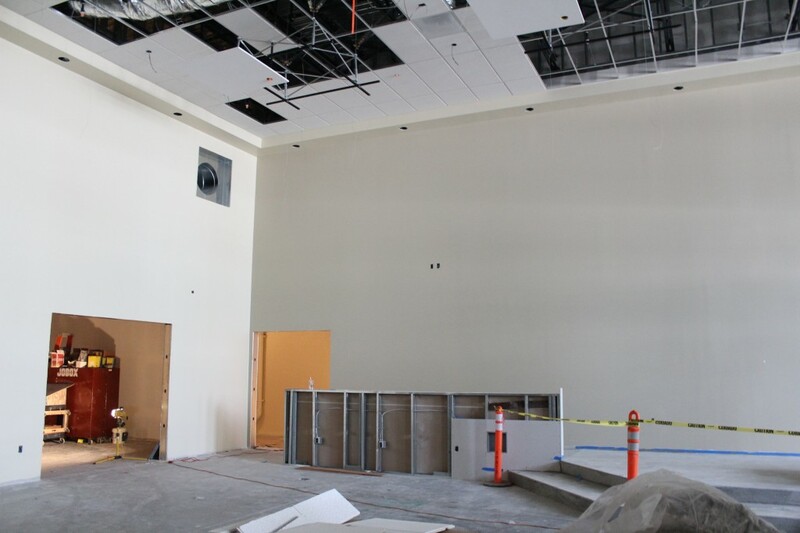 In the new Church there will be hard wired phones, networks for transferring data, and wireless access point that are driven by hard wires. 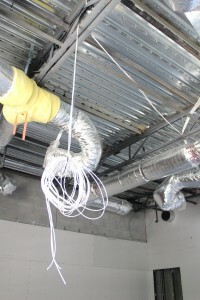 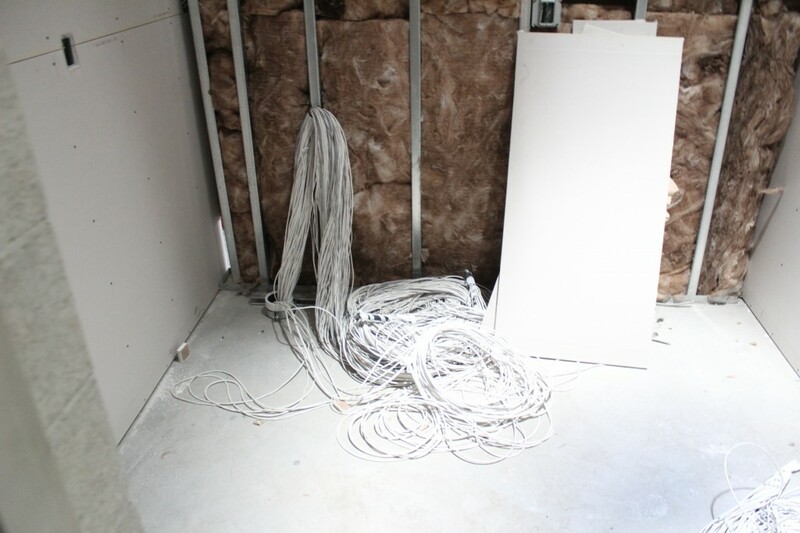 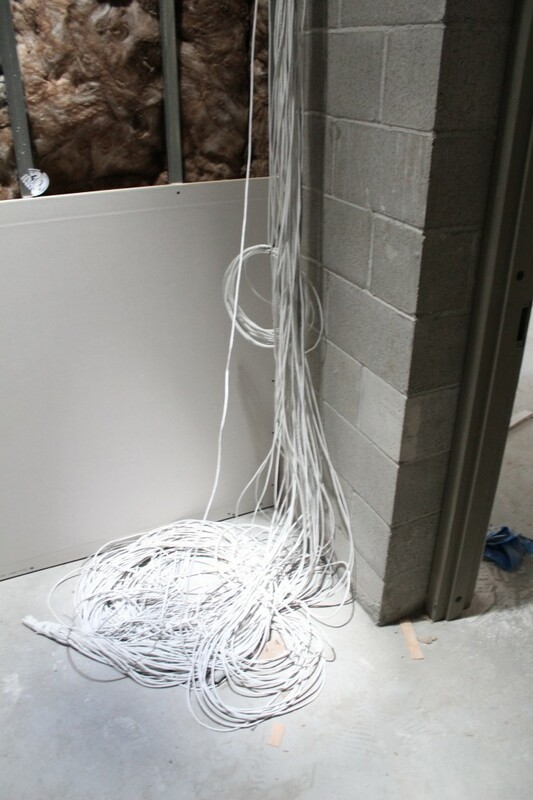 The pictures below, taken July 11th, are a random sampling of wires and in many cases bundles of wires that support our connectivity in a safe, reliable manner. 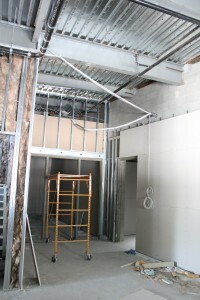 These July 11th pictures provide a glimpse at the structures that support the toilets and connect them to the water sources and drains – usually not seen as they are behind the walls. Also not usually seen are the “rated shafts” that connect one floor to another. 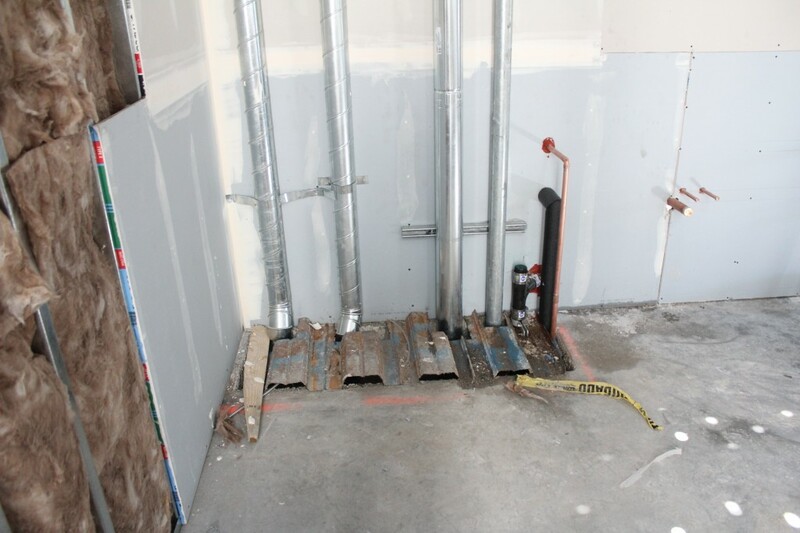 In case of fire, these passageways between floors must remain in tact for one hour under varying degress of temperature.